Thanks to Internet and social media sites, visuals play a big part in today’s world, and stats show that online articles containing relevant images have 94% more total views. So, if your emails don’t include great visuals, you’re missing out on the opportunity to fully engage with your readers. As a nonprofit, it’s not enough to include an image or two. You need to include relevant visuals that make a connection with your readers. It is important to evoke emotion and show them why their support is vital to your organization. In email marketing, your visuals will have the most impact towards the top of your email and stretched across the template. While one of the most basic visual forms, images can have an emotional impact in your emails. Picking the right image for your email can increase the chances of your subscribers taking action. It’s important to continually build a library of images so when it comes to creating an email, you can add the one that best fits your content. Use real photos from your organization versus stock images for the best results. You can boost the effect of your image by adding text on top. Try creating a catchy headline, stat, or call-to-action. 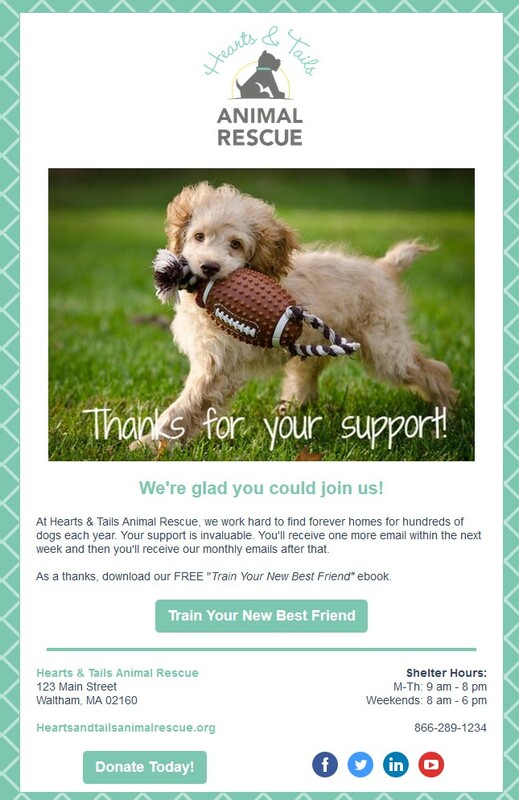 Check out this example where they used an image of a dog from the shelter and added text on top to thank people for signing up. It’s simple, but draws people in to what the message is about. One of the most engaging types of visuals is video. The video hosting company Wistia, recently found that emails including video had a 300% click-through increase over emails without video. As a nonprofit, video is a powerful way for you to make a meaningful impression on your audience. Put a face and voice to your organization to make your communications more relatable. You don’t have to be a professional videographer or have expensive tools. Use your smartphone to capture videos for your organization. Using an animated GIF in your email is a great way to catch your subscribers’ attention with movement. Stats show that emails with animated GIFs get a 12% higher ROI (Return on Investment). In fact, they’re a great way to boost the effects of your images and videos. As a nonprofit, you’ll likely want to create your own animated GIFs that fit your organization’s goals. Your GIFs don’t have to be funny or “cheesy” if you don’t want them to be. Plus, when you’re using your own content, you won’t have to stress about legally sourcing the GIFs. Use a tool like Giphy to easily create your own animated GIFS. Upload a series of photos to create movement with a slideshow effect or turn part of a video into an animated GIF that links to the full video. Be sure to use more subtle animations in the GIF, as you don’t want it to be distracting. Also, play with the settings and timing to ensure that the animations aren’t too fast. You want the GIF to support your message and draw readers in to continue reading. In this example, an animated GIF was used to create a slideshow effect that scrolls through images of people who’ve adopted pets at a shelter. It’s a great way to support the fact that the shelter is saying “thanks” for adopting, while asking for feedback on the experience. Now you can use a variety of these different types of visuals in your emails to ensure your cause makes a lasting impression. Over time, you can use your Open and Click reports to determine which visuals your audience responds to the best.